Congratulations on deciding to hone your psychic abilities and spiritual gifts; a worthwhile pursuit! David is your trusted guide, the advisor you want when life gets unclear, puzzling or confusing. Combining a scientific approach with a grounded spirituality, David’s wisdom will see you through any of life’s challenges and successes! There’s a rich, unlimited energetic world ready for you to know of it, so go for it! Reach out with any questions at any time. Congratulations on deciding to hone your innate intuition, to strengthen your psychic & mediumistic abilities to guide others and to make better life decisions using your spiritual talents. This is a unique and wonderful journey filled with self-discovery, self-mastery, purpose and excitement. My desire is for everyone on Earth to discover this side of themselves because it will enrich their lives so much more! Books are great but you can only glean so much from them and they’re not personalized to your individual needs. The truth of the matter is that no matter how many resources you read on psychic skills, meditation, mediumship or energy, there are some things you cannot learn without direct experience. This is why studying with someone who is experienced and who has literally been there and done that, is vital to your full development. Let me walk with you on this rewarding journey. Also, developing your psychic abilities may be confusing or overwhelming at times. Achieving your true potential as a psychic or a medium becomes more straightforward with a living resource, a mentor that you trust. I pride myself on being respectful, encouraging and gently accountable for those times when you need to be pushed beyond your comfort zones. Think about how amazing it is to have a partner to speak with when you feel challenged, lost or insecure with your abilities and insights. I know that my mentors were instrumental in assisting me to fully develop as a psychic medium. Don’t give up. Instead, get mentored! Personalized, one-on-one access to me. That’s showing up completely present and engaging my entire System – Mind, Body and Spirit – which has over 30 years of experience with our 7th Sense, psychic ability, mediumship, Astral travel and the Akashic Records. Through our conversations, coaching, in-person interactions, as well as email & text, I’ll provide education, real-world training, gentle accountability and all around respectful mentoring so you can grow beyond those familiar comfort zones. I will always offer my intuitive insights about your gifts and their development. As you develop, and at whatever level you are at, I will give you answers to your unique experiences and your specific questions about psychic development, spirit and mediumship. and because all mentorees are unique, whatever specific needs you have! The costs to you in not working with a mentor? You deserve to journey up your purposeful path and heed the call from the Universe that this is what you should be exploring or doing. Stop going at it alone because you’ll save time by not having to figure it all out on your own and avoiding the common pitfalls that befall every psychic or medium. You deserve to be happy, successful and confident pursuing this work. You’re also likely being called to be of service in the world and you can do it all in a way that is useful, clear, practical and leaves you feeling great, uplifted and energized! Working with me is simple and straightforward because we find the way that is best for you. Whether its connecting once in a while or having unlimited access to me, we’ll see what you desire based on your intention! Sessions together will take place in-person (if you are local to Seattle), over the phone for those in the US and via Skype for those outside the US. Working together with me is structured yet in a relaxed and friendly manner. Though it is a mentor/mentee relationship, I will see you as a peer. Prior to any session together, I recommend that you clarify and write down your intention for our time together. Note some questions that you have, and target any areas where you are having difficulty. Once a session or package has been purchased, I will contact you within 48 hours to set up your first appointment. 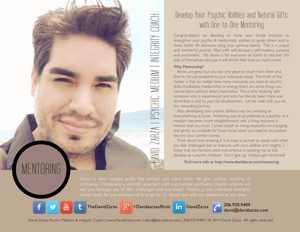 Mentoring sessions are available Tuesday – Friday from 11am to 7pm PST. If you do not receive an email, or have questions about setting up your session, please contact me here. Ideal for those who are feeling stifled, stuck or you have many specific questions! If you want to connect with someone who understand what you’re going through but you may not need, nor desire mentoring on a long term basis. Those who feel or know they’re gifted, but don’t know where to start and want to talk to someone who won’t judge them or think they’re crazy. Those who are already working as a professional psychic, medium or in an intuitive helping profession and are having trouble with the “outer” part of this work, such as setting boundaries with clients or getting comfortable charging money for this type of work. Those who feel stuck and can’t find answers to their questions in books or on the internet, or in any other source. ELITE mentoring was developed from my own experiences with mentors and by client requests to work together on a regular, longer term basis. Have limited access to classes or mentors in their area. Prefer private mentoring to group coaching. Know where they want to go with their gifts, but don’t quite know how to get there. Are willing to put in the hard work and practice, but want someone to help give them a “road map” to get there. Want someone who can encourage them when they are struggling and give them a kick in the pants when needed. It allows me the opportunity to listen to what you need. If I feel as though I can’t help you, I will tell you so. Even if you don’t sign up for mentoring, there is no charge for this preliminary conversation. It allows you the chance to connect with me prior to investing and making a longer term commitment. Where you are in your intuitive/spiritual development? How you envision or desire me helping you? What your personal goals are in working with a mentor? As you can imagine, this sort of attention and access limits how many ELITE mentorships I may take on. Space in my ELITE program is very limited – there’s only one of me available! The time in between our sessions will give you a chance to practice whatever skills/strategies that we’ve talked about. These may be certain exercises to enhance certain abilities or challenges that will take you outside of your comfort zone. Subsequent calls will start with me asking you any follow up or questions to our last call so that I know where you are with getting things done. Next, we’ll address any issues or questions that you encountered. Then, we’ll talk about action steps for you to take before our next call. Your Investment in ELITE Mentoring — $1111 a month and there is only 2 Spaces Currently Left! If you have any questions, please contact me here. Or if it is easier, you can message me through my Facebook page here.